Do you want to talk to 600 dedicated high school band students in one place? College Night at WIBC U is the place for you this November. Attend the WIBC U Convention from Friday, November 22 - Monday, November 25, 2019 in Seattle, Washington to be a part of this exciting event. Not only can you attend honor band rehearsals, WIBC U rehearsals, director & WIBC U clinics, sightreading sessions and evening concerts, but you will have the opportunity to talk to the WIBC high school honor band students about your university and your program. On Sunday afternoon all attending college directors will set-up tables in the Northwest Ballroom to talk to honor band students from 2:45 pm - 5:00 pm (at no additional cost). 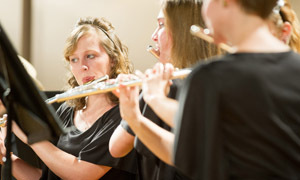 The WIBC honor band students will visit with the various colleges between their rehearsals. Only attending college directors will have the opportunity to visit with WIBC high school honor band students during this college night event. College directors, click here to register for the convention.